We’ve been here before. The Internet was a peer-to-peer network until it wasn’t. Likewise the Web. Some have forgotten, and most never knew, that Tim Berners-Lee’s original browser could write and publish as well as read pages. By the early 2000s the pendulum had swung so far toward centralization that, as it began to swing back, we called the “two-way web” one of the pillars of “Web 2.0.” Personal publishing flourished for a while, then the pendulum swung again toward centralized social media. If Scott’s right, and I hope he is, the pendulum is about to swing back toward a more distributed Web. Thali is one project moving in that direction, there are many others. When we compared notes with Jeremie Miller the other day, he pointed us to a long list of fellow travelers. Another observer, Doc Searls, periodically issues updates with pointers to related (and some of the same) efforts. It behooves all of us to sort out how these efforts are similar or different along various axes. Some are peer-to-peer, others not. Some bind identities to public keys, others don’t. Some skew toward messaging and social networking, others toward bulk data exchange or publishing. Some consider themselves personal data stores, others don’t. Many are “friend-to-friend” networks with peer-to-peer trust models, some aren’t. There are platforms, protocols, overlay networks, and apps in the mix. What else belongs on this list? What are core attributes? What are the best axes along which to compare? The tag cloud is suggestive but it’s only my lens on the list, I’d love to see other lenses applied to the same (evolving) list. Note that Pinboard (as with del.icio.us long ago) such lenses can be applied — and in a decentralized way! You could import my redecentralize feed into your own Pinboard account and tag the links according to your world view. 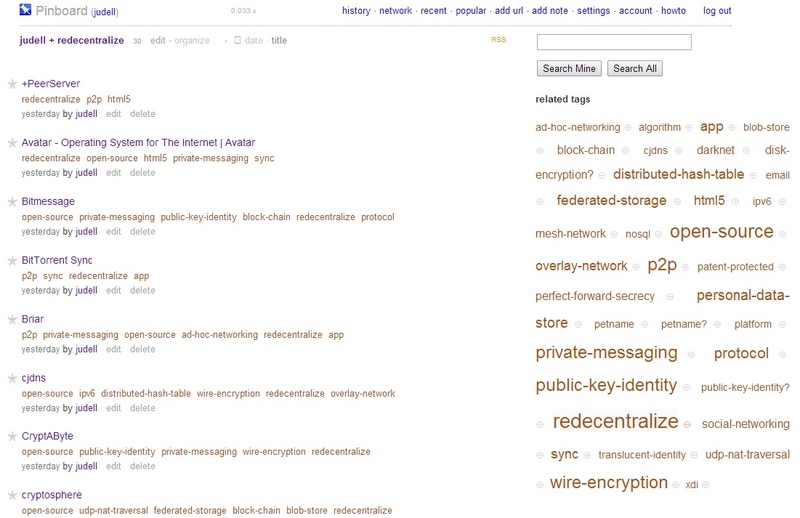 We could compare one anothers’ views, and see a combined view at https://pinboard.in/t:redecentralize/. While that’s a very cool way to do collaborative mind-mapping, it’s not likely to happen in this case. But comments here (or elsewhere) will be welcome. “Content-centric networking” efforts like http://www.ccnx.org/ probably belong on the list too.